Earlier this week I had the opportunity to teach at USC. I was teaching an entrepreneurship class and I spoke for about an hour and a half. It was good. But did they leave the class with a takeaway? And then I went to an Entrepreneurs’ Organization event the other day where I got to hear this entrepreneur speak about how he’s been through a lot of different things. He talked about how he’s had crazy experiences (like completing five Ironman events)—basically his life story. Take podcasts, for example. I listen to them at 2X speed. Podcasts are sometimes 1-2 hours long and I don’t need all that content. I just want one idea to take away. And that’s what everything comes down to: that one thing, that one key takeaway. Of course there is a trade off to this kind of hyper-efficiency: I don’t retain as much information and my comprehension is probably a bit diminished. But if you can change the way you think about your daily activities and measure what you’re doing in terms of depth rather than breadth, then being able to fully and deeply take away just one thing means you are good to go. That’s what I think about every time I do my Marketing School and Growth Everywhere podcasts. If I can just give you one thing to do, one idea you’re inspired by, one key takeaway—I know I’ve succeeded. 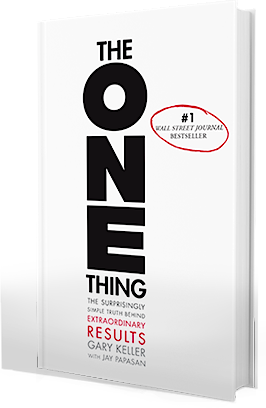 There’s a book related to this concept called The One Thing: The Surprisingly Simple Truth Behind Extraordinary Results. It’s about productivity and how to prioritize and be really efficient with your time, and it applies to your entire life. For instance, whether I go to a networking event or a conference, I just want to meet one person. Instead of trying to “spray and pray” by handing cards out to a bunch of people, I want to just meet one great person. That’s it. In the long run, going deep with any kind of relationship pays off. It’s a lot more rewarding and fulfilling. 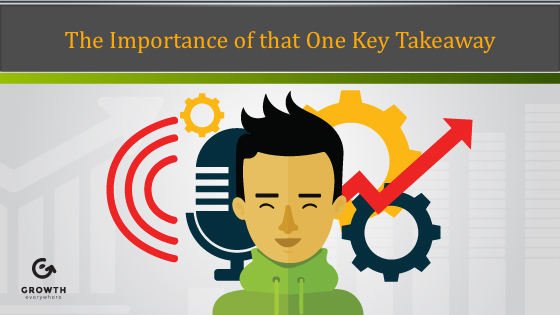 One key takeaway, one thing—that’s all you need to eventually taste true success.